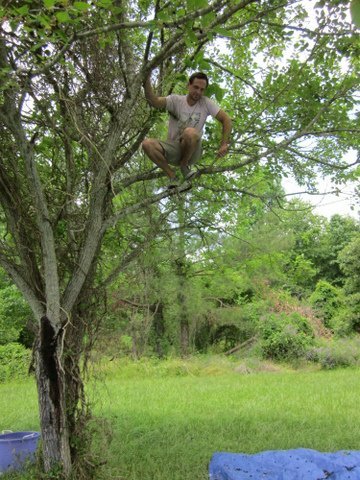 Around the farm, we must have at least 15 mulberry trees — all of which delight the local wildlife. If ever we manage to get up in the early morning light (read: only once did we manage this), we can spy on the wild turkeys, bunnies and squirrels scavenging for fallen berries on the grass. The woodpeckers, cardinals and other birds congregate in the mulberry trees these days, pecking away at the ripe black berries. It helps if you have an assistant to shake the trees…. 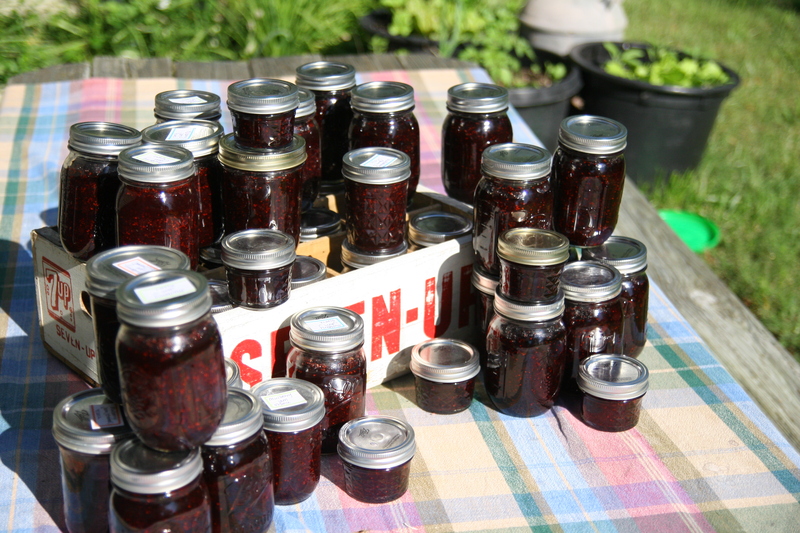 Not to be left out, we have twice gone out and spread tarps beneath the trees and shaken those berries free to be made into jam, cobbler and more. Mulberries are sweet without the tartness of most other berries, and despite having grown up in southern California with a treehouse in our front yard mulberry tree, I never really had a taste for them. But I think I’ve been converted. They’re so abundant, juicy, and jammy (not to mention free) it’d be a shame not to take advantage of them. Fair warning: though the harvesting is rather easy, cleaning is a pain. Bugs love the berries as much as the critters, and when shaken from the trees they all make it into the bowl, along with twigs, leaves and such. Last week M & Mom G took on the task of cleaning them, which thanks to the bounty of their harvest, took nearly 4 hours. 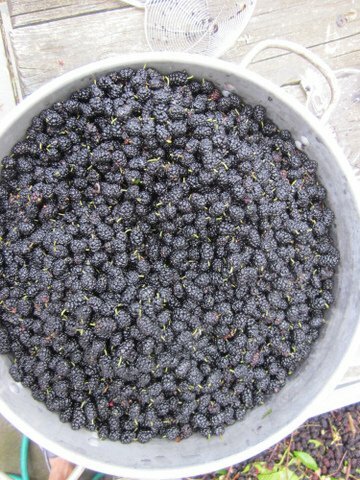 To date, we’ve made almost 40 pints of mulberry jam! Each batch we formulated slightly differently — some included chopped granny smith apple, ginger or vanilla. And since the berries are so sweet, we managed to use less than 1/3 of the sugar recommended for tarter berry jam (like raspberries). In a pot, add all the clean berries and use a potato masher to smush some of them and let the juices out. Bring the temperature up to near boiling, then add the pectin and bring to a boil. Then add the sugar and other ingredients. Cook until it boils for 2 mins or so (to ensure the pectin has activated), and then pack into sterilized jars and can them. Previous post ← Garden Update: It’s Working! Ohh elderberries! Sounds delish. 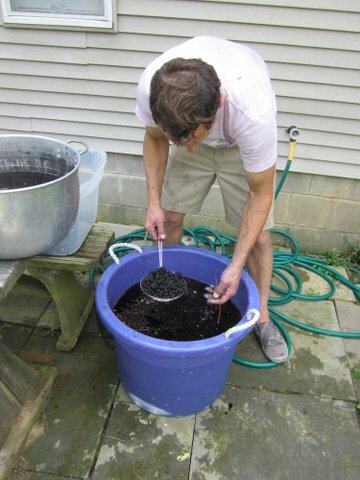 We have done the soaking method with the big vats of berries – very effective. We have wild black/raspberries to look forward to in July, so surely we’ll be making even more jam! We are planning to have canned food for ourselves & friends for the rest of the year….if it looks like we have surplus, we may sell, who knows! We haven’t tried the wax tops, just the self-sealing Ball lids, though I am curious how the wax would work. Hi, Becky, Love this blog! Before cleaning picked berries, that may have bugs in them, it’s good to them sit in the pail (overnight or for a few hours) in a cool place (nobody has such a place so get an ½ sized, puny old fridge, maybe practically for free somewhere) and magically ALL THE BUGS CRAWL UP TO THE SURFACE. Usually, anyway, most of them. Next week we’ll be picking fistfulls of elderberry flowers to make the sweet juice with sugar and lemon. Mm. Chris ays y’oughta get some elderberry bushes. Fast-growing, both the flowers and the berries make a tasty and amazing juice.